Around seven thousand years ago in the Pacific Northwest's Cascade Range, a stupendous volcanic eruption blasted 25 cubic miles of lava, rock, and ash into the atmosphere and onto the earth's surface. This massive eruption resulted in the collapse of the entire upper portion of Mount Mazama and created the caldera that holds the placid beauty we know today as Crater Lake – the deepest lake in the US at 1943 feet. It's likely that early peoples of the Klamath tribe witnessed the cataclysmic eruption of Mount Mazama, and archaeologists have discovered sandals and other artifacts buried deeply under layers of volcanic ash and pumice. The Klamath regard these clear blue waters as a sacred site, and their legend explains that Mazama's peak was destroyed in the midst of a battle between two gods: Skell the sky god and Llao, the god of the underworld. Tantalized by stories of secret gold mines, prospector John Wesley Hillman and his companions headed towards the region in 1853. Encountering the stunningly clear blue waters of lake spanning 5 miles across with depths then unknown must have left the travelers without adequate words because Hillman's notes simply suggested calling this place "Deep Blue Lake." Ultimately renamed twice more as Blue Lake and then as Lake Majesty, likely because of its simply majestic presence as it serenely rests within the crater of Mount Mazama. Finally, the name Crater Lake took hold and stuck. The park was eventually established as the 6th national park in an effort to preserve its vast natural resources and surplus of beauty. On May 22, 1902, President Theodore Roosevelt signed Crater Lake National Park into official recognition as a treasure for all Americans. Talk of the rich history of Crater Lake National Park isn't complete without mention of the Army Corps of Engineers and the Civilian Conservation Corps' role in the construction of the park. Between 1913 and 1919 many improvements took place to enhance the visitor experience while in the park, most notably the construction of Crater Lake's most popular scenic driving route and trailhead access point, Rim Road. Once visitors tear themselves away from the lake's splendor for a bit, they spend time exploring the seasonally flourishing plant and animal communities here thriving and enjoy various outdoor pursuits. 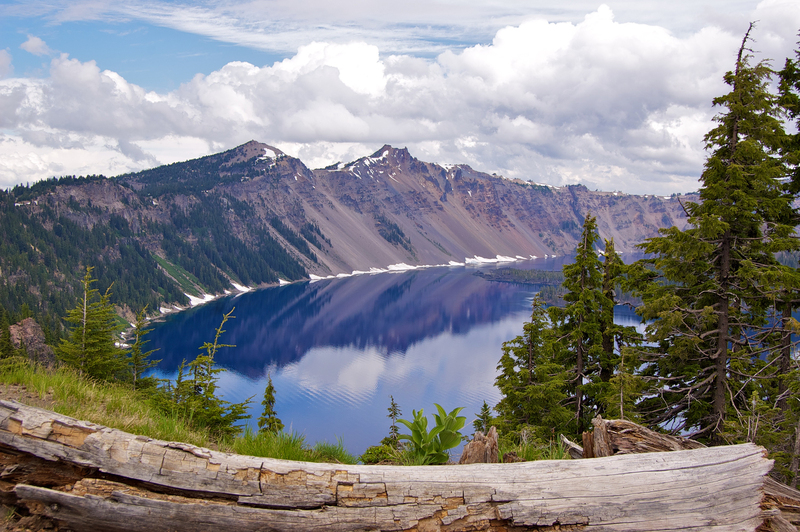 Crater Lake's subalpine climate means that there are long winters and a short summer. Heavy snowfalls are common, and hard frosts aren't unheard of in the summertime. Most activities and ranger-led tours are available in the summer while the winter activities such as snowmobiling, cross-country skiing and snowshoeing draw in the snow-loving crowd. Rim Drive – 33-mile Rim Drive allows Crater Lake to be easily discovered by every visitor with eight magnificent overlooks and observation areas of Skell Head, Kerr Notch, Pumice Point, and other fascinating points of interest. Hiking trails will lead trekkers to Watchman Lookout, Discover Point, Sinnott Memorial, and other popular sites. Access Rim Drive from the south side near the Munson Valley Historic District or the northern entrance (closed in winter) near the Pumice Desert. In the spring and early summer, Rim Drive offers stunning views of the various 600 species of wildflowers that grace the park, and birding enthusiasts flock here from around the world to spot seasonal golden and bald eagles. Wizard's Island – Using the park's convenient ferry service (in operation during the summertime) allows visitors to get out onto the lake and head to Wizard's Island, the volcanic cone that climbs hundreds of feet above the surface. Phantom Ship – Named for its resemblance to a spooky ghost ship on foggy nights, twisted branches and seven trees frame Phantom Ship, an island and landmark just off Crater Lake's south shore. Phantom Ship provides some contrast against the perfectly placid sheet of blue. Public ferry services and boat tours operate in summer. Hiking – Discovering the old growth forests of the Cascades is readily available off Rim Drive, but the portion of the Pacific Crest Trail that traverses the park is a hiking enthusiast's dream. Mountain Biking – With 12 miles of pavement circling the rim of Crater Lake and rental bikes and helmets available right at the park's marina, mountain biking pursuits are popular summer activities. Kayaking – No visitor can resist the tranquil and seemingly impossibly deep cerulean waters of the lake. Fortunately, kayak rentals abound, and ranger-led tours are also available. Horseback Riding – A favorite activity offered through ranger-led tours, horseback riding excursions are also offered by many lodges near Crater Lake National Park. Fishing – Although there are no indigenous fish in Crater Lake, it was stocked long ago. Today, it harbors several species of self-sustaining populations of fish. Snowboarding, inner tubing, snowshoeing, cross-country skiing, and snowmobiling take over the park during the long winter season. By far, snowmobiling is the most popular winter activity at Crater Lake National Park, and visitors will want to be sure to use the North Park Entrance and obtain necessary permits or secure a rental before beginning their adventure. Many other winter activities and snowshoeing tours are available through the park's ranger programs. Whether visitors are seeking lodging in Crater Lake National Park or lodges near Crater Lake, a few standout accommodations should be considered. The rustic atmosphere and modern guest amenities at Diamond Lake Lodge are only surpassed by the pristine lakeside views offered at this comfortable lodge. Lodging near Crater Lakes National Park in Klamath Falls can be found at Cimarron Inn, an ideal respite for budget-minded travelers. The Running Y Ranch is also in Klamath Falls and is arguably a recreational paradise with full-service accommodations.